Programmable and internet connected devices like the Arduino are exploding in popularity. There are quite a few videos on up YouTube showing fun integrations between Delphi and various bluetooth, wifi, and serial connected devices. Here are the top 10 Delphi device integration videos I’ve seen. Some of them utilize Delphi XE8 Firemonkey apps on Android and IOS while others are simple Delphi 7 VCL apps using a COM port. There are three different Arduino integrations, two different drone integrations, a brain interface integration, a robot arm integration, a depth sensor integration, an animatronic head integration, an integration with beacons and mobile devices, and a gesture control integration. Three runner ups are listed at the end and they are a swimsuit integration, IP camera integration, and a temperature sensor integration. Add your favorite Delphi hardware integration videos I’ve missed in the comments below! There are four different servo motors that control this creep animatronic head. Is that the Firemonkey light in his eyes? This is a slick looking control interface for changing the room lights by sliding the colored bars in this Delphi app. Another similar video is here. Nothing says this is the future like watching a guy fly a hovering vehicle with his mind. There is a second longer video with more explanation and background that you can watch here. The Delphi app in this video is actually playing back a list of commends to create the sketch. You can see the depth data made available via the Kinect SDK in this video. Includes sample source code. This one is awesome because of the ultrasonic controllers. The Delphi and Arduino source for this integration is available in the YouTube description. The runner up to this video uses a knob but it also has a speaker (check it out here). It’s hard to top a brain controlled drone but sometimes you just need the drone to go where you want and that’s where controlling it with a Delphi app comes in. I believe the apps demonstrated in this video were covered in a webinar by Embarcadero and you can find all the resources for building the apps here. There is also a second video here where the armband is used to control a photo app in Delphi with gestures. You can test out this app demo yourself and get the Arduino side of the source code here. It isn’t quite clear how Delphi (or Appmethod) is used. I assume it is used by the sunlight monitoring device as the control app on a tablet or phone. This video is good but it is someone long as it contains a lot of technical details and a lot of connected devices. Really good showcase of technology. This integration with Delphi is achieved via simple serial port interface. 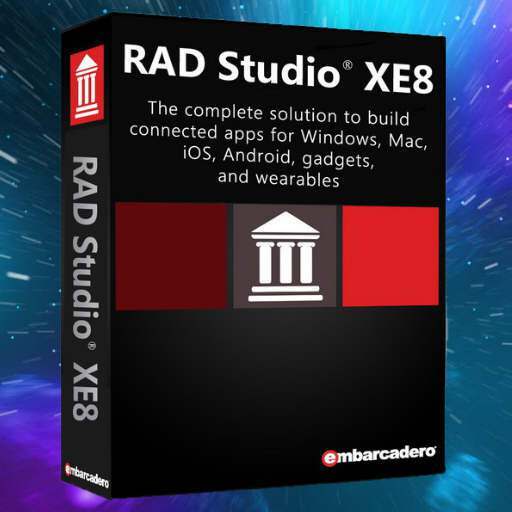 You can utilize these tips when building Firemonkey apps with Rad Studio XE8, Delphi XE8, C++Builder XE8, and Appmethod for Android, IOS, Windows, and OSX devices. In a mobile world it is more important than ever to secure and compress your data connections. Your users are hopping from hotspot to hotspot and switching between 2G, 3G, and 4G as they travel while using your apps. You never know how fast the data connection will be or who might be trying to snoop on your enterprise data. Delphi XE8 uses the platform native HTTP clients for it’s REST requests so that it’s SSL/TLS implementation is always up to date. You can secure other types of connections using SSH tunneling. If you are deploying a local database like SQLite (or Interbase) with your app you can encrypt the local database by setting a password. Whether it is company enterprise data, user medical data, or even user photos encrypting your local database will help keep your app data and your user’s app data secure. It is never a good idea for your users to feel like your app is frozen while it does a calculation or loads some data. Using a native progress or activity dialog can keep your app fast and responsive while your app performs work in the main thread or even other threads. With mobile apps especially it is always a good idea to check for a network connection prior to attempting to open a connection. Users on mobile devices can enter and leave connectivity at any time as they travel and your app should be built with this in mind. This applies to REST, app tethering, and straight TCP/UDP connections. Some mobile platforms (like IOS) even require that you make network connections outside of the main thread so utilize anonymous threads as much as possible. If the virtual keyboard pops up over your memo or edit control in the lower half of the device screen you will need to implement a solution to scroll the field into view. There is a demo included with the latest version of Delphi called ScrollableForm which demonstrates another way of doing it. Whether you are sending an enterprise notification about a company event or notifying a user that they have a new message increasing user retention by utilizing push notifications can really help your app succeed. Push notifications are what allow you to re-connect with a user even though the user is not currently running your app. You can utilize the BaaS components in Delphi XE8 to implement push notifications through Parse and Kinvey or you can use a third party component which implements the Pushwoosh API. There are nine premium styles that come with Delphi XE8 Firemonkey and they can really give your app a professional look. Utilizing premium styles can also allow you to provide a light and a dark theme so your users can decide which works best in their lighting environment (Hint: the dark themes work great in full sun environments). Be sure to test out using gradients and images on your form backgrounds to really make these premium themes pop. When building multi platform apps be aware of the different buttons and events available on each platform. You can handle the back and menu (VK_MENU in OnKeyDown and OnKeyUp events) buttons on Android devices so your users will have an intuitive flow inside of your apps. You can also utilize events like FinishedLaunching, BecameActive, and EnteredBackground to handle changes in your app’s lifecycle. There is also a bonus component called TfgApplicationEvents which gives you easy access to OnIdle, OnOrientationChanged, and OnStateChanged. The standard TListView component that comes with Delphi XE8 takes one-two lines of text (a title and a detail), an image, and an accessory icon on the right. If you want to display more lines of text in each item you will need to add a custom ItemAppearance. One of the custom ItemAppearances that can be installed supports 4 lines of text (a title and 3 details). Additionally, you can create your own custom ItemAppearances and add even more. Lastly you could also use a TListBox where you can embed any number of other controls within each TListBoxItem. There are a lot of different icon sizes that you will have to create to support all of the different devices and device resolutions that are available. Each of the four major app stores (Google, Apple, Amazon, and Samsung) have their own icon size requirements. There is a free utility available which makes this easier or there is a free website which will generate icons as well. A second free tool will help you make all the splash screen images you need. When deploying to Android devices be sure to add your icon to the homescreen so user’s can easily find your app. Don’t have an icon yet? Check out this set of 750 free icons from Google. Delphi XE8 comes with a TAppAnalytics component which allows you to see how users are using your app. The feedback you receive from analytics allows you to make smart decisions on how to iterate the next version of your app. You can add custom event tracking anywhere in your app and send exception information automatically to the server for review. Seeing exactly where users may be getting stuck or what features they use the most is gold. The TAppAnalytics feature is a cloud service with both a free tier and paid tiers. There is also a third party component that allows you to also track your app usage using Google Analytics. Both components require an internet connection. DOUBLE BONUS: Take a deep dive into the inner workings of cross platform mobile apps built with Delphi XE8 Firemonkey. Check out more tips for Delphi XE7 Firemonkey on Android, Delphi XE5 Firemonkey on Android, Delphi XE5 Firemonkey on IOS, building games with Firemonkey, debugging Delphi XE7 Firemonkey apps, and migrating from C# and .NET to Delphi. If you are new to working with a full featured framework like Firemonkey you may be wondering at the size of the apps that Delphi XE8 Firemonkey generates. The Firemonkey Framework has hundreds of thousands of lines of code that allows you to jump ahead and start building the app you want to build now instead of the bricks in the road to get there. Hopefully this infographic will provide some insight into what makes up an APK/IPA cross platform application deployed from Delphi XE8 with the FMX framework. The infographic covers Android, IOS, Windows, and Mac OSX apps/packages/libraries/archives created using the Firemonkey framework. Tools that utilize the Firemonkey framework are Delphi XE8, C++Builder XE8, Rad Studio XE8, and Appmethod. The infographic only covers Release mode (something you could deploy to your customers). I have also included a VCL section in the infographic so that you can compare the Windows only VCL framework to the cross platform FMX framework. Also keep in mind that when you use debug information or are in Debug mode your file could be significantly larger. The sizes of the generated files are included in the green circles. There is the normal compiled size and then there is the compressed or packaged size. APK and IPA files are packaged and compressed. The compressed sizes for Windows and Mac OSX were achieved using the 7Zip format. Here is some information directly from the infographic as well about what units are included in a FMX app on Android (it is slightly different on each platform) and how those units effect the size of the deployable file. You can find out more about the Firemonkey Framework on the Embarcadero DocWiki and on the FiremonkeyX website. 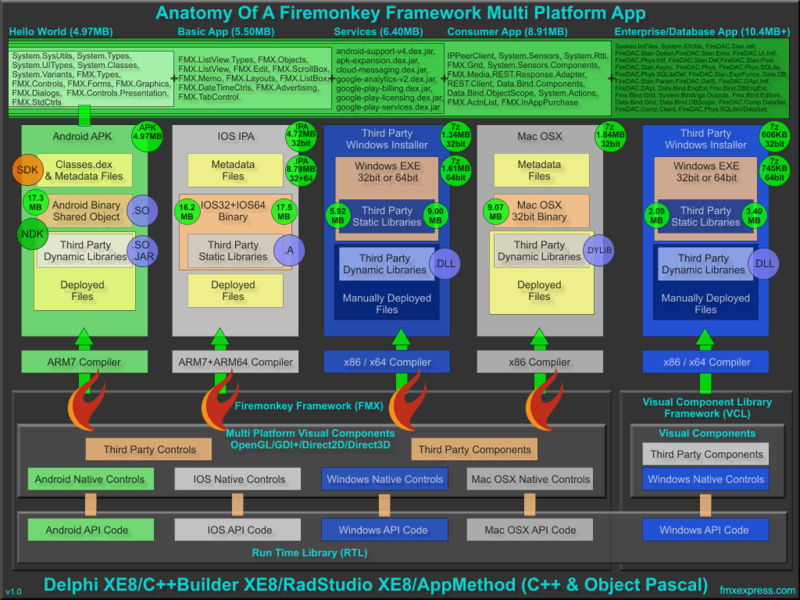 Download the full Anatomy of a Firemonkey Framework Multi Platform App infographic for future reference. Embarcadero has a page up on their developer network site which links to all of their video sessions, tutorials, and demos for Firemonkey and mobile. This includes links to CodeRage 8 and CodeRage 7 sessions, CodeRage Mobile sessions, lots of different videos about Firemonkey, videos on building cross platform applications with Delphi XE5 Firemonkey, and even a few videos for HTML5 and C++Builder. The videos cover building applications for Android, IOS, Windows, and OSX. There are twenty eight different links and each link usually provides more than one video. As you may have noticed by now this is a massive collection of content you can use to bring yourself up to speed on building apps using Delphi XE5 Firemonkey. Since Embarcadero’s latest offering, AppMethod, runs Firemonkey all of these videos can be used if you are looking to learn how to use AppMethod as well. Most of the videos require that you register before you and start viewing. Head over and browse the 28 different Delphi XE5 Firemonkey video sessions, tutorials, and demos.